Dragons, unicorns, fairies, zombies...and Santa. At the center of it all stands Dee, a man immortalized in legend as Decompose. An ongoing war between unicorns and dragons has led to the creation of a plague...a deadly infection Dee is the host for. Not quite human, but not a unicorn either, Dee and the plague form a symbiotic relationship, resulting in immortality of the undead kind. Every ruling Empire has desired control of Decompose. Controlling the infection means control of the people. An intervention of an old rival, Santa, results in Dee going missing. When he resurfaces decades later, Dee has one goal: locate the mythical cure to his plague. However, complications of the heart force Dee to decide whether he truly wants to find the cure and give up being Decompose. 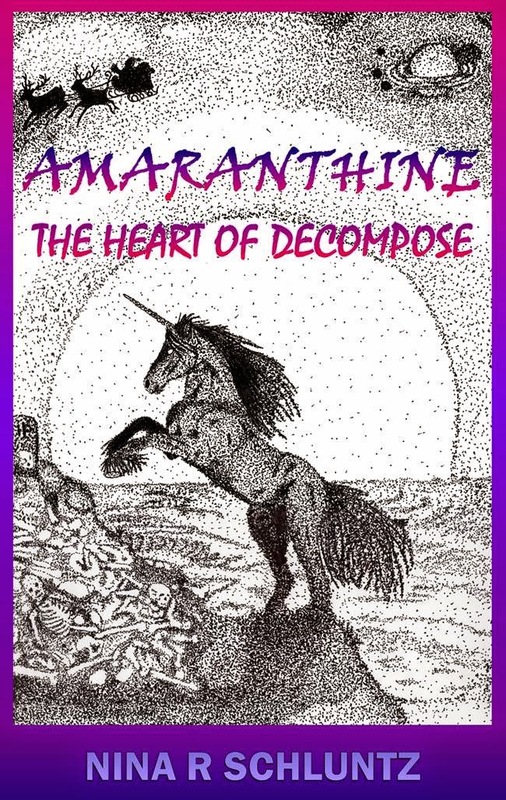 The mix of genres in Amaranthine: The Heart of Decompose is unique and creative. There's fantasy with unicorns, dragons, and fairies, horror with zombies, science fiction with space travel and life on other planets, and a touch of romance. It's amazing how Schluntz had these elements all come together to make a unified story. Santa is even in there! Amaranthine begins with finding out that several different planets, including Earth, have been infected with a plague that turns the inhabitants into zombies. The plague was created during a war between unicorns and dragons, and Dee also known as Decompose, carries the plague. The cure lies in his friend, Jhon, and the two end up getting separated. Dee must find Jhon in order to cure the inhabitants of the different planets ravaged by the disease. The action and tension kept me on the edge of my seat. Dee and Jhon had an enormous task ahead of them, not only to find each other but also to cure people and stay a step ahead of those who wish to use the infection to control their people. And Dee straddles the line between life and death - he doesn't really belong to one or the other. I grew to like Dee, but it took me time to get used to Jhon. I wasn't sure about him for a while. There are a couple of other characters who are as important as Dee and Jhon, but I don't want to say who they are or talk about them because I feel it would give too much away. I will say one character I liked quite a bit, and the other I liked but not quite as much. 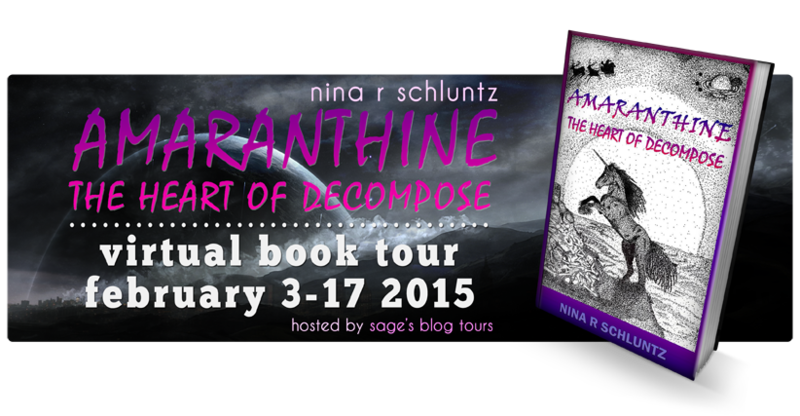 Amaranthine is a novel I believe will appeal to fans of any or all of the genres it includes. It gives a fresh take on zombies - they aren't all like the zombies you're used to - and I loved the space travel aspect of the novel. I haven't seen a novel mixing these genres together before, and it's a cleverly written mashup of horror, fantasy, and sci-fi. And there are unicorns! Did I mention unicorns?! Her husband continues to ensure her stories maintain a touch of realism as she delves in the science fiction and fantasy realm. And their kitty, a rescued Abyssinian, is always willing to stay up late to provide inspiration. 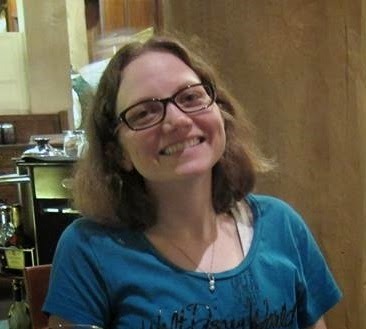 Visit her blog mizner13.wordpress.com for information regarding previous and upcoming publications. She also posts book and movie reviews for a wide variety of genres. I can't wait to read the book that's super I'm super excited for you Nina! !